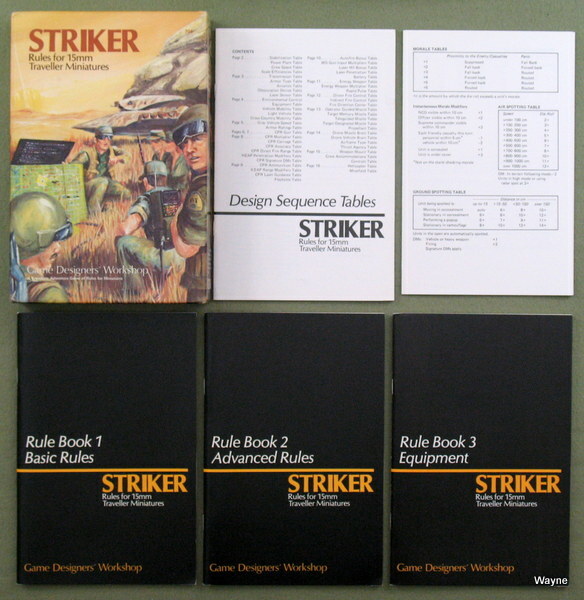 CONTENTS: • 6-page rule booklet • play map • 2 chart cards • 480 counters. "The Epsilon Cetus system, containing an M5 red dwarf and a G0 yellow star, was originally colonized by two independent relocations missions, each of distinct ethnic origin. The first to arrive, and thus to claim the better G0 system, were those of Islamic origin. The fact may be seen in the names given the two stars, and to the planets of the system they colonized. For the primary, the name An-Nur, meaning The Light was selected; the far companion named Az-Zarr, or The Distresser. The five worlds were then named Al-Hazzak (The Provider), Al-Mughni (The Enricher), Al-Mumit (The Killer), and Al-Akhir (The Last). The second mission, of Chinese origin, arrived some 50 years later, in a crippled colony ship. Entering the An-Nur system, they found it jealously guarded by a handful of Islamic ships, and had to crash-land instead in the far poorer quality red dwarf system. This early incident left a lasting animosity between the two cultures. The survivors did manage to establish a small colony in the second system, and eventually selected their own astral names through the time-honored device of the I Ching; being the names of hexagrams describing the qualities in plain view. They adopted their own names for the two stars, calling their primary Chin, meaning Progress, choosing to ignore its low luminosity and occasional flares. The other star they called Kou, or Infiltration by Inferior Men. The closest of the planets was called Chien (Growth) paired with its fertile satellite I (Help From Above). Working outward, the worlds were then called Ta Yu (Wealth), K'an (Danger), and K'un (Adversity). Some years later, Lu was discovered incoming in a cometary orbit, its name meaning Newcomer. Over two centuries, the Islamic culture established itself in its system, exploiting its mineral and ecological wealth to the fullest, and developing a thriving interplanetary society. The Chinese colony, on the other hand, was forced to spend the past 150 years in a spartan struggle for survival against marginal environments and the unpredictable flares of Chin. The only redeeming feature of their system has been the industrialization made possible by the rich mineral deposits of Ta Yu. 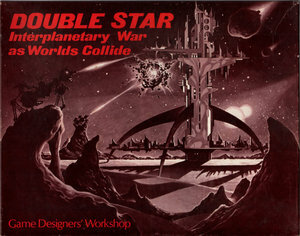 Thus, the stage is set for Double Star — a science-fiction game of interplanetary warfare within a binary star system. Two players assume the role of leader of an entire culture, and must lead it to victory over the other." "With Earth an overcrowded world, the new frontier is the asteroid belt lying between Mars & Jupiter. There it is possible to find riches enough for a lifetime, or a quick end to life. 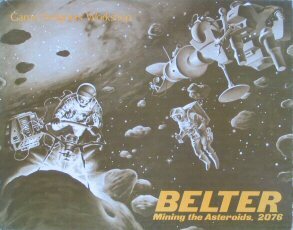 More than a simple boardgame, Belter introduces elements of role-playing and imagination while realistic constraints (supply and demand, supervised elections, physical violence) shape the course of the game." To the Imperium which has ruled the stars for ages, the Terrans are the new barbarians, beating at the gates and vandalizing civilization. 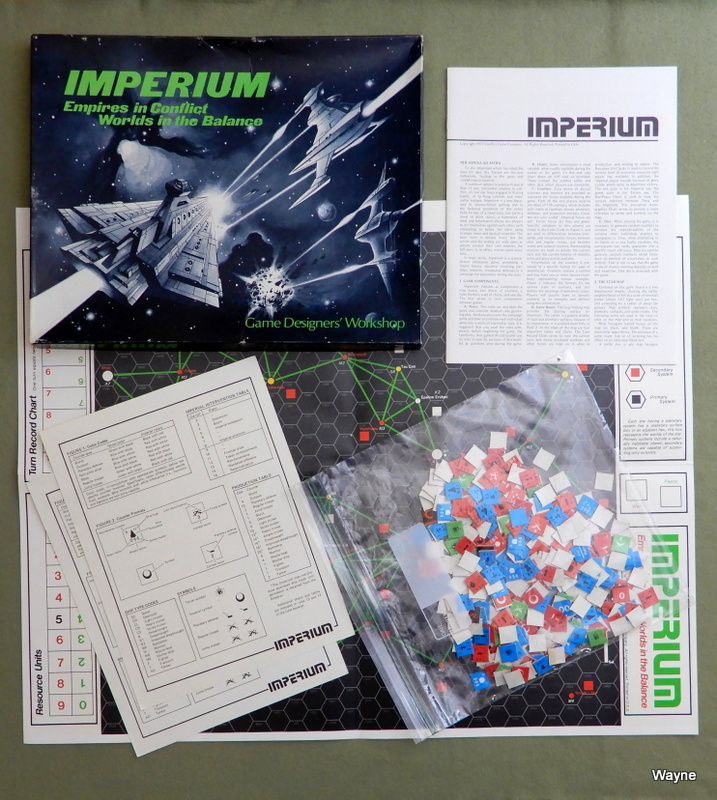 In basic terms, Imperium is a science-fiction simulation game, presenting a future history situation involving starships, industry, troops and defenses in a campaign for supremacy among the stars." CONTENTS: Rulebooklet; 2 reference cards; poster-size map; 352 counters. More photos over at our Games Gallery! * 240 die cut counters for adventurers and defenders. * One rules booklet covering combat, movement, and scenarios (Rules Booklet: Azhanti High Lightning). * One TRAVELLER Supplement describing these giant starships (Supplement 5: Lightning Class Cruisers). * Playable with TRAVELLER; playable alone. For ages 12 and up. 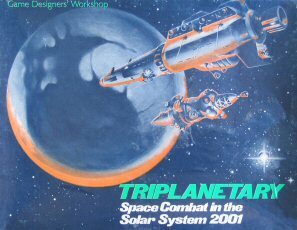 "Triplanetary is a game-simulation of interplanetary conflict in the early 21st Century. Spaceships of various strengths and capabilities use vector movement to flit across the Solar System in scenarios reproducing the future conflicts of piracy, alien invasion, interplanetary war, and political oppression. A. A set of rules, including game charts and game scenarios. C. A game map showing the inner Solar System along the plane of the ecliptic. The hexagonal grid (composed of hexagons, or hexes) assists and regularizes movement and positioning of spaceships. The map is covered with protective plastic, to enable use of the marker in drawing ship courses. After each game, ship courses can be erased with a cloth. D. A marker, used to draw ship courses on the map." "Poised just beyond the frontier of the Imperium stand the war fleets of the Zhodani Consulate. Four times in the last five hundred years, they have attacked in campaigns to wrest control of the vital resources and rich worlds of the Spinward Marches from the Third Imperium. Now they strike again, and the Fifth Frontier War begins in earnest. 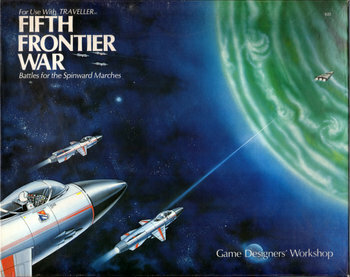 Fifth Frontier War is a Traveller campaign game portraying the progress of a far-reaching interstellar war and its effect on the many worlds that are its battlefield. The game is playable independently as a tense, fast-moving simulation of interstellar war. Rules cover starship squadrons and space battles, troop units and worlds at war, and the details of long-range interstellar planning. Special rules cover the operation of ship fleets, the use of naval bases, troop carriers, and advanced technological levels. Special charts cover every aspect of combat during the game. Fifth Frontier War includes a large, four-color map of part of the Spinward Marches, complete with planetary surface boxes detailing the many planets within the area. 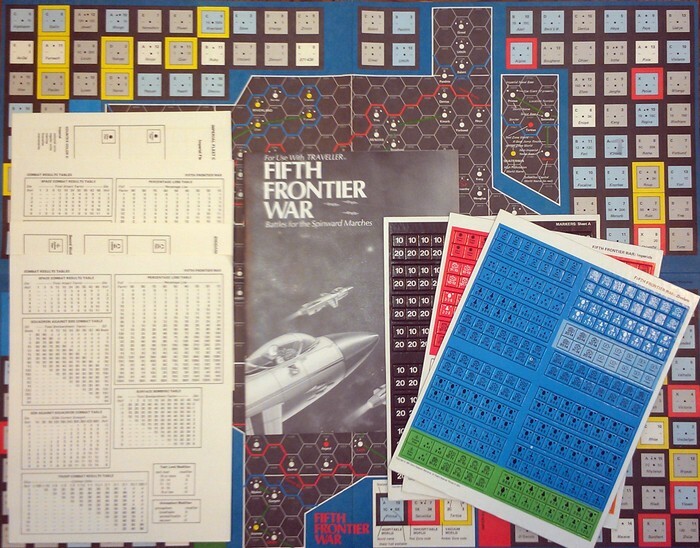 Three sheets totaling 720 die-cut counters provide starship squadrons, troop units, fleet markers, admirals, and other details essential to the game. The rules booklet details how to play the game, while the charts provide easy reference Information." "In the dark days at the end of the Solomani Rim War, the last defenders of Earth hold out against the mighty squadrons and armies of the Third Imperium in a desperate struggle to hold their home world and continue their battle for the independence of the Solomani Confederation. If they win, Earth stands free; if they lose, Earth falls to the enemy. Invasion: Earth is an adventure boardgame of an invasion that covers the basic concepts of space movement, orbital defenses, planetary landings, and ground combat on Earth itself. The spherical nature of Earth is an important aspect of the game, and is presented in an easily understood format with a geodesic map. Forces involved in the war range from small battalions to armies and cover a wide range of specialized capabilities. The game system places commanders in conflicting positions with widely different goals. Invasion: Earth is a complete boardgame playable by two persons. In addition, Invasion: Earth is also a Traveller boardgame. It can be used in conjunction with the award-winning Traveller science fiction role-playing system to create adventures, scenarios, and situations set on the Earth of the far future." 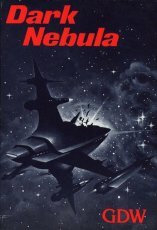 From the 1983 edition: "As the free trading ship Beowulf jumps between the stars, a small band of passengers quietly assemble pistols from parts concealed in their luggage, and then make their way stealthily to the crew's quarters and the bridge ... As they near the entrance to the control room, an alarm trips, and shots ring out — the situation instantly becomes a life and death struggle for control of the ship. 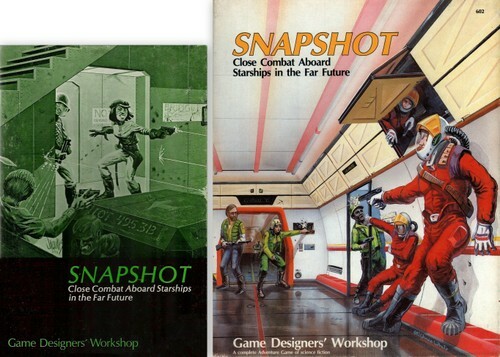 The clash is but one of many possible scenarios in Snapshot, a detailed game of close combat aboard the starships of the far future. Almost any plot is possible: mutiny, boarding parties, hijackings, even piracy. And almost any outcome is conceivable, from ignominious defeat to total victory. Snapshot is an expansion of the basic personal combat rules in Traveller, enhanced for use with a square grid, and adapted to allow play without a referee. Rules additions make the game completely playable on its own; yet entirely mateable with Traveller adventures and campaigns." Set includes rule booklet, 4 8x10 maps, counters. 1978 edition comes in ziploc bag; 1980 edition is a mini box set in the format of the early Traveller box set; 1983 edition is a box set with a new color cover. "From the depths of interplanetary space, a faint message is received by local monitoring stations, repeating a position and a single word, mayday... In the early days of radio, a standard distress call was established, using the international language of the day. The simple statement "help me," stated in French, came out "m'aidez." English speaking radio operators pronounced and spelled the word as mayday. Since then, the word has become as accepted in English as its Morse code predecessor, S.O.S. Mayday is a science-fiction game of small spacecraft in danger, distress, and combat. Using realistic vector movement and intriguing combat systems, Mayday presents a fascinating and enjoyable situation for hours of stimulating recreation. SERIES 120 Mayday is a Series 120 Game, published by Game Designers' Workshop. Intended as both a realistic simulation and an enjoyable game, Mayday is designed to be played (by two or more players familiar with the game rules) in less than two hours. Learning the game initially should take no more than 45 minutes." "As the Aslan Hierate and the Solomani Confederation expand into unknown space, they meet, and soon fight, in a struggle for control that will bring the victor greater economic and political power. 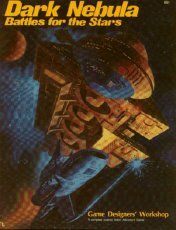 This is the setting for Dark Nebula..."
1980 EDITION: "Asteroid pits a carefully chosen team of varied talents against the diabolical computer mind and its robot minions in a battle for the fate of a world. This game includes eight geomorphic interior maps of the base, 120 die cut counters, and complete rules. For ages 10 to adult; playable in two hours or less." 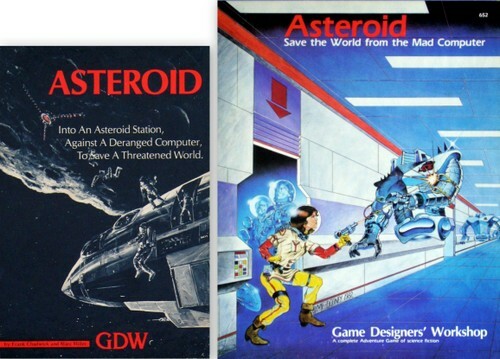 1983 EDITION: "Asteroid Mining Station Nine Seven Bravo (Remote), controlled by a berserk computer brain, is on a collision course with Earth. You must overcome the station's defenses, disable the computer, and set demolition charges to self-destruct. Professor Delacroix. The Prof is one of mankind's leading scientists. His area of specialization is difficult to determine as he seems to know just about anything. Scoop. Ace reporter for the World News Service. Scoop cannot carry any useful equipment as he is completely burdened with a videotape camera unit. Lucky McGee. Lucky is impossible to shoot, fixes things by kicking them, and gets amazing results from computers by punching buttons at random. Muscles McGee. Lucky's brother claims to be the strongest man in the world and, while this may not be strictly true, no one argues with him about it. Sasha. Sasha, a dog, is the station mascot. Well-trained, and intelligent (as dogs go). Carter. A mining engineer, Carter's chief trait is that he dislikes dogs in general and Sasha in particular. Nicholle. The Prof's daughter. Love blossoms in an atmosphere of danger, and this expedition is no exception. The fate of the planet is in your hands!" "The Universe of Traveller — Communication is limited to the speed of courier ships. Remote central governments exercise only limited control over the affairs of their frontier territories. Megacorporations struggle for control of sparsely settled mineral-rich worlds. And everywhere, there are mercenaries for hire to settle disputes. Striker fills an important place in the Traveller universe — rules for ground combat with 15mm figures and vehicles. 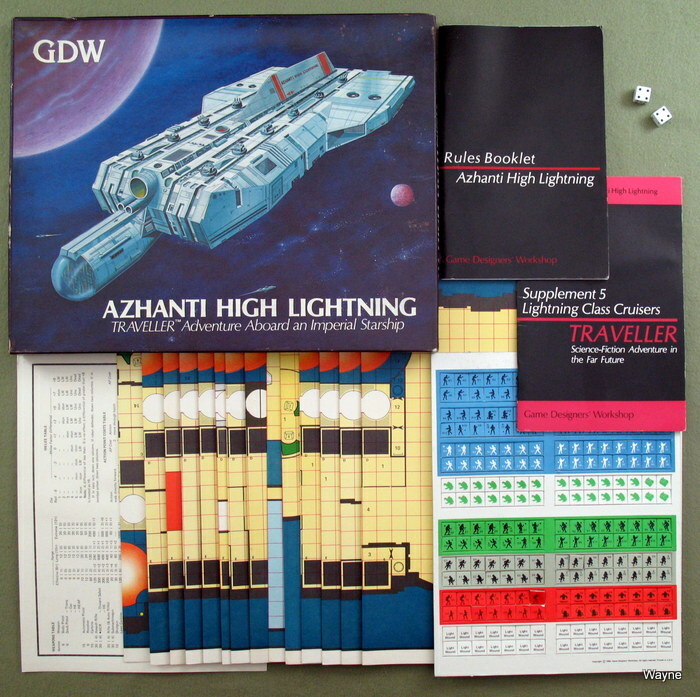 The basic combat system used in Striker is based on the popular Azhanti High Lightning game system. The movement system is simplified for use with larger forces and a ground scale of 1"=25 meters. 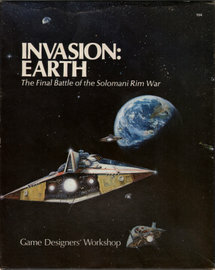 The basic rules are written with the beginning miniatures player in mind and can easily be used as a combat resolution system for existing Traveller games. All weapons covered in Traveller and Mercenary (Book 4) are rated for use in the game. The true value of Striker, however, lies with the advanced rules. A complete system for designing armored vehicles and aircraft at different tech levels is presented, along with air-to-air and air-to-ground combat rules. The package contains everything a Traveller adventurer needs for campaigning with miniatures." 7- Striker (the Traveller 15mm ground miniatures game system)"
Heaven and Earth is an amazing star system creation utility for Traveller. The Exodus Project has some great hard sci-fi resources. Far Future Enterprises. Copyright 1977 - 1998 Far Future Enterprises. 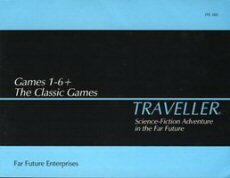 Traveller is a registered trademark of Far Future Enterprises.